Novak Djokovic, right, puts his hand on Andy Murray’s shoulder after their final match of the French Open tennis tournament on Sunday. Djokovic won 3-6, 6-1, 6-2, 6-4. Novak Djokovic isn’t just chasing the records of his sport’s all-time greats. He’s accelerating in his pursuit. After winning his first French Open title on Sunday, Djokovic holds all four major titles at the same time, the first man to do so since Rod Laver in 1969. He is halfway to winning all four in one year, leaving him closer to winning a Grand Slam than any man since Jim Courier won the first two in 1992.1 He has won 12 major titles, just two behind Rafael Nadal and five behind all-time leader Roger Federer. And on Monday he will be No. 1 in the rankings by the enormous margin of 8,045 points, leaving him in a strong position to overtake Federer’s record for the most weeks at No. 1 as soon as 2018. 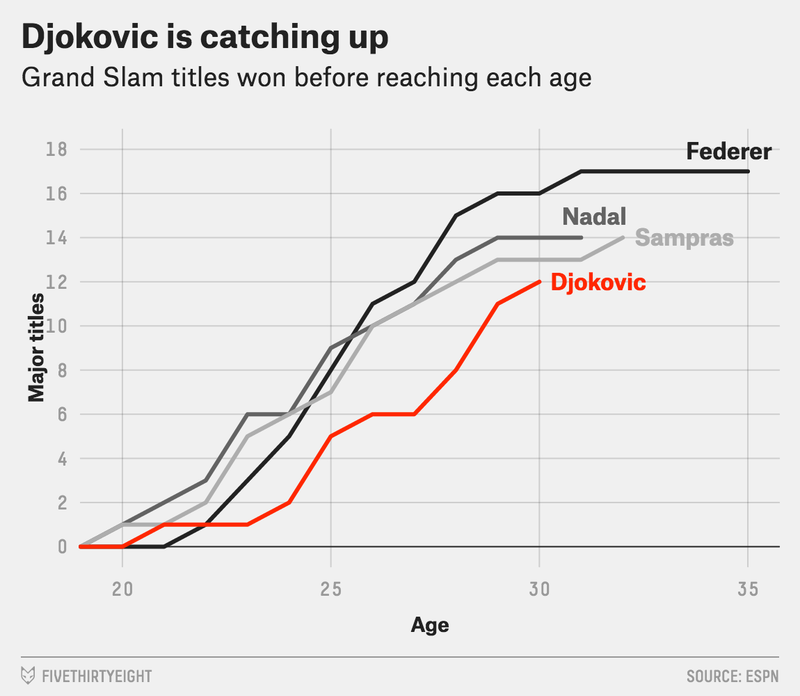 History suggests Djokovic should be slowing down, not speeding up, at age 29. Even all-time greats have rarely won many major titles so close to 30. While the sport has become kinder to veterans, just two majors were won by a man 29 or older in the last decade: Federer, at Wimbledon in 2012; and Stan Wawrinka, over Djokovic at last year’s French Open. 1) He’s playing outstanding tennis, the most dominant of the Open era. Our Elo ratings at the end of last year showed Djokovic topping all other men since 1968, an era that encompasses just about every contender for the greatest career of all time, though it omits many of Laver’s best years. More conventional stats confirm Djokovic’s dominance. Men’s tennis has three types of events that feature nearly all of the best players who are fit to play: the four majors, nine Masters and the World Tour Finals. Djokovic has reached the final of 21 of the last 22 of these events he has entered, winning 17 of them. No man has ever had a stretch that dominant. Andy Murray should be Djokovic’s biggest rival. Murray was born exactly a week before Djokovic, has an eerily similar game and has dealt him three of his biggest recent losses: in the finals of the 2012 U.S. Open and 2013 Wimbledon, and in the 2012 Olympics semifinal. But since Murray’s Wimbledon win, Djokovic has beaten him in 13 of their 15 meetings, including all five of their matches at Grand Slams. The reasons were evident in Djokovic’s defeat of Murray in Sunday’s final: In just about every facet of the game, Murray is great but Djokovic is greater. Murray has an edge in one scenario: When he’s lobbing the ball and Djokovic is smashing it. That doesn’t happen often enough to swing a tennis match. 2) The men who used to hold Djokovic back when they were at their peak are fading as he continues to soar. If Federer and Nadal hadn’t been around, Djokovic probably would have won many more majors by 2010. He faced them 11 times at majors through the 2010 U.S. Open and lost nine of those matches. Since then, Djokovic has beaten them in 11 of 17 meetings at majors, including the last five. And he may not meet them many more times at majors, with both men struggling with injuries. Federer withdrew from the French Open before it began, and Nadal withdrew after the first two rounds. 3) Djokovic doesn’t yet have any younger rivals. That is stunning for a man at age 29. Players younger than him have won just two majors combined: Marin Cilic and Juan Martín del Potro, both born a year after Djokovic, have one apiece. Neither has made more than one major final. And men born in 1989 or later have not won a single title of note. No major, no Masters, no tour final. The entire generation of men younger than Djokovic who should be leading the sport hasn’t lifted a single significant trophy. By this stage of the season two years ago — when he was the same age as the 1989ers — Djokovic by himself had won six majors, three tour finals and 19 Masters titles. This might look like a chicken-and-egg problem: Have players younger than Djokovic struggled because he is an all-time great who keeps ousting them, or because they’re not very good? The answer is a little of both, but more the latter. Djokovic has ousted men younger than him from Slams in the fourth round or later only 17 times in his career. None were in a final. The primary reason the younger guys aren’t breaking through isn’t because Djokovic keeps stopping them. It’s because other older guys are. While the men ages 23 to 28 might retire as a collective lost cause — a weird void in the tennis record books — the men younger than them show real promise, including Dominic Thiem, who will enter the Top 10 on Monday, and Nick Kyrgios. They will have to grow up in a hurry if they are to slow Djokovic’s run at the record book. At the moment, aging or injury look likely to be his biggest obstacle. Mats Wilander was the only man other than Courier to win the Australian Open and French Open back-to-back since Laver’s 1969 Grand Slam. Wilander did it in 1984-85 (back when the Australian Open was in December) and in 1988.